The newly introduced dependency (the “sub-project” e.g. custom control or such) is also being actively developed, and I will want the option to pull in any changes as that library evolves. I may, in the course of working on my “main” project, make some modifications to the sub-project, some or all of which I decide should be incorporated into the main line of development of the shared library. Set a reference to the binaries of the shared library from within my main project, perform all modifications to the shared library from within that project, and re-build so that changes are reflected in the binary outputs. 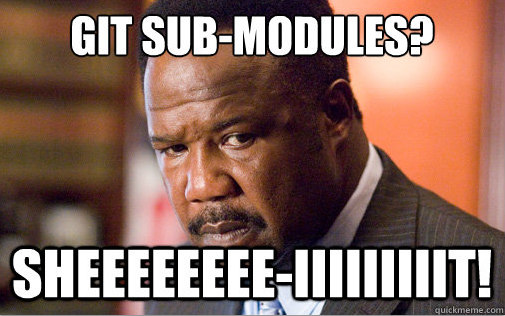 Use Git “Sub modules” to refer to a specific commit within the library project, and manage the updating of these commit pointers as the library project evolves. Copy the dependency project source into the main project. Yuck. Isn’t the whole idea of libraries to avoid this type of thing? 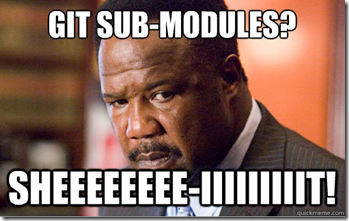 I have not used Git sub modules much, but my limited experience with them indicates to me that outside of certain circumstances, they are a pain. Equally unsatisfactory under the conditions I described in the first paragraph is the managing of a standard binary reference (especially in cases where I may need to customize the shared library within my main project, while keeping it up to date with the development repo. The third option is not even worth considering. Confused yet? It makes sense in a minute. 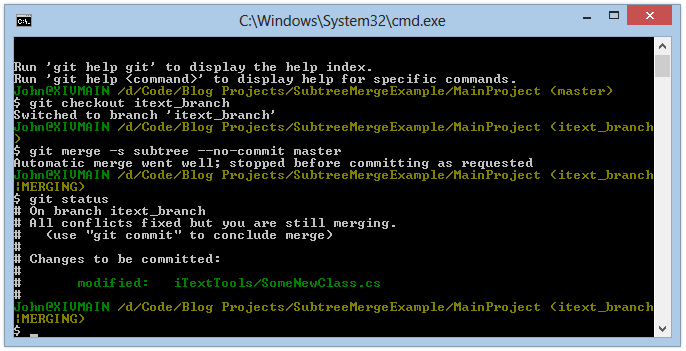 Let’s walk through the process of creating a subtree within an example project, and then we’ll discuss some things to pay attention to when it comes to merging changes to and from the subtree remote. I have created an example project as the “main” project for use in the following examples. I will be using a Pdf Merge utility project created for another post on this blog as the “shared library.” The main project is called, unsurprisingly, “MainProject.” The shared library is my oh-so-useful iTextToolsExample. We will assume I have already created MainProject, created a local repository on my development machine, and a remote repo on Github. From the Git command line, we set up a remote that points at the repository for the shared library project. I will be using an example project as the main project, and adding a shared library I created for another post as a subtree. Note the warning after we fetch about “no common commits.” That’s ok – we wouldn’t expect there to be an common history here, we are importing a library for that very reason! Now is when we perform the magic. We will use git read-tree to read the contents of itext_branch into a subdirectory of master. This will be essentially the same as copying it all in, with on small exception: Git knows and remembers that this is a subtree related to the remote tracking branch itext_branch. Now, what if there are changes introduced to the main shared library source project? 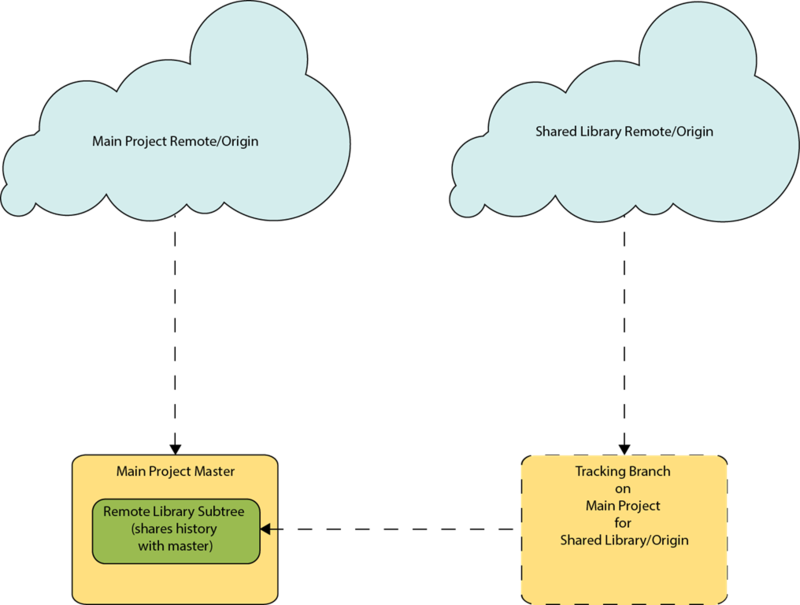 How can keep our sub-project in sync with mainline development on the shared library? In the above, the --s flag indicates that you are going to specify which merge strategy git should use in merging changes. This is followed by the strategy itself, which in this case is the subtree strategy. We are also telling git to squash the commits from <source_branch> into a single change set, and to not automatically commit when the merge is complete. 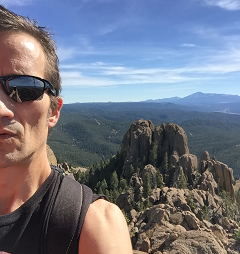 From here, simply commit (with a descriptive commit message!). If you made some changes to the shared library code within your subproject and decide you want to push them out to the main development repo, the process is essentially the same, in reverse. 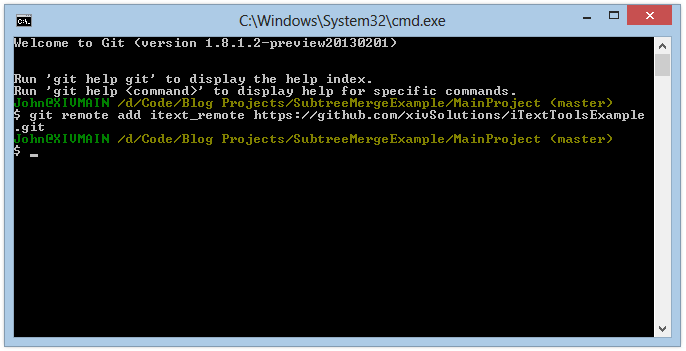 You merge from the subtree directory within the main project (again, explicitly specifying the Subtree Merge strategy), out to the tracking branch that points to the shared library remote. Then push the changes up to the remote. Once you have made changes to the shared library from within branch master of your main project, commit the changes as normal. Then, checkout the tracking branch that points to the shared library remote. Now commit the changes. I usually state clearly in the commit message that these are changes from <project>/subtree so that, when added to the shared library, I can clearly identify that this set of changes came from the sub-project. Now it’s time to push the changes back up to the main shared library repo. Note that using the syntax above will push the changes into a new branch in my remote repo, named (not surprisingly) itext_branch. This will allow me to apply the changes to the master or production branch of the shared library using a merge or pull request (in the case where I am not the maintainer of the shared library). I have brushed through the basics here. There are numerous ways to condense some of the commands I used here, and like most things, there are probably dozens of different viewpoints on how to best manage project dependencies in source control. The Subtree Strategy has been working best for me, in my working context, but I welcome your feedback, and especially, corrections where I might have it wrong, or have missed seeing a better way. You are so very correct – ooops! Thanks for catching that. Will update when I get home from work! Possible typo: around sentence " The –s flag tells git to go ahead and update the working tree with the new changes. " — there is no "-s" flag in the examples. Do you mean the "-u" flag?